Fiddlerman Master Violin- anyone have it? Thoughts? After some emails back and forth with the shop, I just ordered the Fiddlerman Master violin outfit. I'm a *fairly* new student of the violin. I have played my old one off and on for about 8 or 9 years but never took lessons until the last 2 months (which have been AMAZE!). Anyway, I've been realizing how terrible my current violin is (bought from a run of the mill music store for not very much..its a really shiny Palatino that makes my ears sad). I have been trying out violins. Haven't found much in my price range in shops except the Scott Cao outfit. Feeling frustrated by the small selection (trying to keep it under 1K), I turned to fiddlershop. They have been awesome to say the least which makes me feel much better....but wondering what any of you have to say about the instrument? Any Fiddlerman Master Violin owners....thoughts? ..... best wishes in your quest !!!! Welcome to the community Sarah, Your story sounds similar to mine. Started Violin at age 9, switched to Cello at age 12 but then quit all at 14. Now that I'm in my 50s I have taken up the viola. Been working at it for the last three or four years in a dedicated fashion. Last March I bought the FM Master's Viola. On occasion I go back to my old student viola, but only in a pinch. Now I love the Master. Can't say I have a lot of experience with anything else, but it has made a difference in the quality of my playing. (Mind you, intonation and bowing are all on me, but there was a noticeable difference). FM offers a great guarantee. I hope you enjoy as much as I do with my FM Master's Viola. Thanks for the input. The Master is on its way and I can hardly wait! I'm excited to hear what my playing sounds like on a reasonable instrument. Hoping it meets all my expectations and they hype on the reviews. I think it probably will... I'm going to bring it to the shop where I take lessons and compare it with the ONLY one they have to offer in the price range. Maybe my dog will howl less when I practice ;). I am drooling waiting for mine to be ordered- soon ! That's my story, and I'm sticking to it ! My "Big girl" violin is on it's way !!!!!! Yay, I'm excited for you, @Leana ! 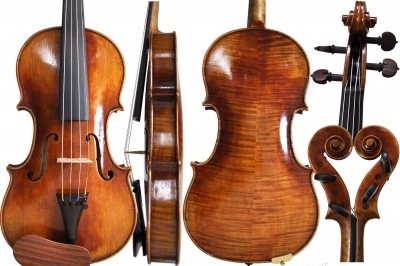 I ordered from fiddlershop a few days ago and am excitedly waiting for my new violin too 🙂 Don't be scared, it will be fabulous. So exciting for sure !! You can see the pictures here. These come with certificates. Not really fond of the color of the SAS chinkiest, but I understand that this is what you want. Do you want a video? I only do them for those who request now a days. If so, what do you want to hear? LOL- I want to hear………….. rainbow connection ! if you have time sure i'd like to hear but if not that's okay. As as long as the chin rest is comfy I don't mind how it looks. It's a pretty violin! Also, you'd think a violin forum wouldn't autocorrect chin rest to chinkiest, it did in my order too. Did you by chance get a new samsung phone and use it to place your order and reply to the forum? I use an ipad to reply to the forum but used a mac to place my order. leana - woo wooooooooo hoo.. excited.. The best days are when violins come.. excited for everyone. share share share. I was busy closing on a new building for Fiddlershop today. Of course I'll record it for you if you like. But what do you want to hear? Congrats on the new building, thats exciting news! OH !!! BTW- GOT MY VIOLIN TODAY !!!! And - Congrats on the new fiddle !!!!!! Yee haaa ! Cool !